We feel strongly about our impact on the Basingstoke Canal waterway. We are trying to be as careful as we can. There are things we know we can do better and we are working on these. If you have any suggestions, please let us know. Either talk to us directly or put your suggestions on our guest feedback forms. 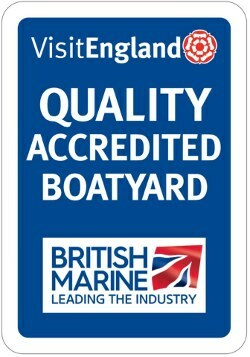 We encourage wildlife into our boatyard; birds and insects. Water is heated as a by-product of the engine cooling system saving on gas/diesel. Laundry is washed by a laundry company which is more efficient than lots of smaller loads washed by us which would use more detergents and power. Since 2014 we have installed engines with lower carbon emissions. We have recycling facilities for glass, paper, cardboard, plastic bottles and tins and have an attractive recycling station in the boatyard, which itself is made from recycled materials. Boxes are provided on all boats so that waste can be separated out, this also helps by not filling up the bin too much and too quickly. We ask guests to bring their own shampoo and shower gel as this reduces waste and amount of recycling. Waste engine oils are collected and recycled. We provide welcome information via email if preferred to reduce paper waste. Please switch off your lights when you are not using them. Use water with care. This will also mean less time spent refilling your tank. Turn your television off at the main switch when your are not using it so that the little red/green light switches off. Boat power comes from the batteries on board – these are charged either from the engine or from the shore mains supply at the marina before your arrival, both of which use energy. So your savings will help a great deal. Please watch your speed and ‘wash’ – bank erosion is serious not to mention the distress caused to the wildlife living on the water’s edge.